Coin Up! review Of Ponpoko! | The Arcade Archives! Coin Up! review Of Ponpoko! Welcome to my Coin Up! Review series! This is something I wanted to do from the beginning- online reviews of games that we couldn’t devote an entire podcast to, but a written review would do nicely. I will be doing these periodically so keep an eye out- I might review that game you have always liked, but couldn’t put your finger on the name- or you just secretly liked while playing your friends at Karate Champ. Is a platform game released by Sigma in 1982. the player controls a Ponpoko, a tanuki that can climb ladders, walk across floors and jump over gaps and apple cores while trying to avoid green caterpillars . The player must collect all the fruits and vegetables in order to advance to the next level. There are also baskets that contain either snakes, fruits, vegetables, or other bonus items. The first time I saw this one was in the Dream Machine arcade I worked at in the South Hills Mall in Poughkeepsie NY. Of course it was placed in the 3rd level section, destined for obscurity from day one. But that was my favorite section of the arcade, so I gave it a try- and I liked it! you play Ponpoko, a hungry tanuki who loves his fruits and vegetables! So much so that he is willing to climb up ladders and jump over anything in his way to get to them! But watch out- feisty caterpillars run back and forth on various platforms to knock you down! And those caterpillars have been eating for fruit as well, for there are apple cores littered around the screen. Jump over those too- or you will fall down! Mystery pots are scattered between platforms as well. touch those, and you might get some bonus points, maybe some fruit- or a SNAKE! The snake will bite you so be careful! Finish the round in time, and get to the next level where more goodies and baddies await! These are the treats that litter the platforms! Keep your eyes on the prize and get them all, as that’s the only way out of the round! These are Caterpillars. This is the main enemy you get to know quickly! They scurry back and forth on a platform, but can’t go up or down ladders. They can be jumped, but timing is crucial! In higher levels is a red and white also blue and pink that moves much quicker so be on your toes! This guy is the snake. He hides in a few pots in each level. you won’t know until you touch the pot, releasing him. Eerie music will play just as you touch the pot- that’s you cue to back away! They move slow, so you will have have a few seconds to get out of his way. You cant’ jump over him so just sit on a ladder until he goes by! Apple cores are placed on the platforms. They kill on contact so don’t touch! Jumping over them is easy, until in later levels when they’re everywhere! Jumping over multiple apple cores is crucial later on. As you jump over one, take a small step back before jumping over the next! These are also called tacks in the flier, but I’ve always thought that they look like Atari joysticks! Now that we got game play and strategy out of the way how about home ports? I don’t think you could play it at home until MAME. Which is a shame as this would have been an easy port on Colecovision or even on the Atari 2600. Wait- there was one game on the 2600 which was very similar to Ponpoko- Fast Eddie! This is very close in game play. 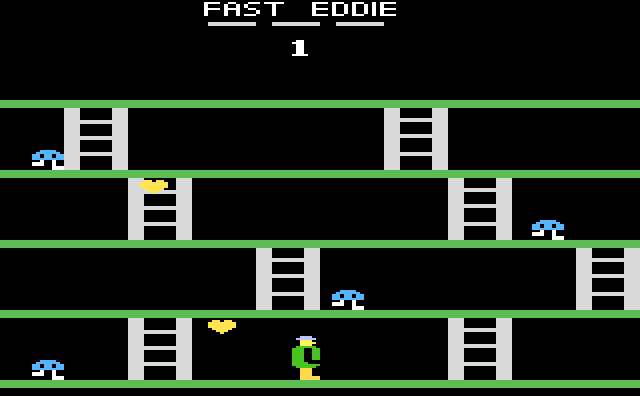 You control Eddie, who has to collect items moving back and fourth on the platforms and jump over the Sneakers who patrol each level. once you gotten 9 items, Hi-Top, the tall orange sneaker at the top of the screen will shrink enough for you you get the key and end the level. Great game with similar strategy, but I believe that’s as close to a true port of Ponpoko as we got back then. If you know of any ports of this great game on any system our on a computer- let me know! Now, let’s give Ponpoko a score. I love this game. but even for 1982 the graphics are way outdated. It would have looked and sounded great for 1980. But in 1982, we had games like Joust and Tron out in the arcades at the same time. they could have put a little more effort into it. The sounds were OK, but one sound stood out- the snake warning sound! It was perfect for that moment when you knew you had to jump back! Now I know what your thinking. but I believe that the controls were pivotal for the game play. This game is about stealth not attack and I think the controls reflect this. This ones a no brainer- I think that Ponpoko amps up in difficulty in a way where you have to keep playing to see the next round. Its hard but not impossible. But the white caterpillars are FAST! Again it goes back to the games core concept- GET THE FOOD IN THE QUICKEST TIME POSSIBLE! and I think it accomplishes that well. It’s a very fun and addictive game- but, with the graphics and sound issues for a game dated 1982- it should have looked and sounded better. Hey gang- Thanks for reading my first review! as a special treat, I will making collectible trading cards of all the reviews I do on the site! The front has general stats (name ,year, manufacturer) the back has game play tips! Collect ’em! Trade ’em! they make great holiday gifts! Please give me a shout and let me know how I did! Thanks for reading and keep playin’ like it’s 1981! 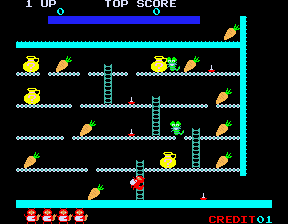 This entry was posted in Archive Entries, Coin Up!, Reviews and tagged 1980s Arcades, Arcade Archives, Fast Eddie, Games Of 1982, Platform Game, Ponpoko by raygunn1. Bookmark the permalink.